He there. 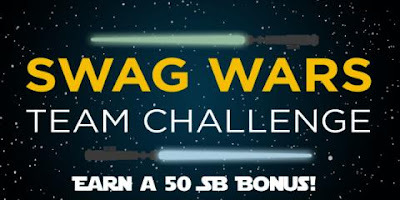 A long time ago, in a galaxy far, far away, Swagbucks had a fun team challenge to help you earn SB from Swagbucks! For those of you who don't know what Swagbucks is, it's a website where you can earn cash back on everyday tasks you do online like shopping, answering surveys, discovering deals, and watching videos. You can even earn for searching the web! Members of the 1st place team will receive a 50 SB Swag Up Rebate, members of the 2nd place team will receive a 35 SB Swag Up Rebate, members of the 3rd place team will receive a 20 SB Swag Up Rebate, members of the 4th place team will receive a 10 SB Swag Up Rebate, and members of the 5th place team will receive a 5 SB Swag Up Rebate. Your SB Swag Up Rebate will be made available on Friday, May 5th and will expire on Wednesday, May 31st at 11:59pm PT. May the Force be with you!